The Statewide DOT L/M team has requested that Division 219 inform the PETs in this region that the Statewide DOT L/M team would like them to send an email to Philip Eng (DOT) and Scott DeFruscio (Civil Service) regarding the recent changes to the CE1 requirements. The Division is aware that a sample letter was distributed earlier this week and has reviewed and made recommended revision to clean up the text. We believe that the text in the sample provided in the link below is professional in manner and accurate. Feel free to personalize if you so desire. Big PEF has crafted and transmitted a memo to Civil Service identifying the ramifications of this change to the CEI promotion requirements. That letter can be found by clink the following link - PEF Letter to CS. Additionally, The Council will be compiling information pertinent to the FE exam, study materials and reimbursement information. A new tab will be developed on the Divisional website to house this information. Please keep checking back over the next few weeks to review this info. In the meantime if you have any questions please do not hesitate to contact any of the stewards. PEF is well aware of the new changes that are being instituted requiring PET to take and pass the FE (Part 1) of the engineering licensure testing in order to be promoted to Civil Engineer 1. The Statewide Labor/Management team held an emergency meeting to address this issue. Unfortunately Management declined to participate in this meeting but PEF Vice President Peter Banks in attendance as well as Steve Connelly, PEF Research and Susan Mitnick, PEF Civil Service Enforcement Officer present. We have been told that the full resources of PEF are behind this fight. There will be information and action links placed on the PEF website soon, so please remember to check in there for updates. This issue is the highest priority for the PEF DOT L/M team and we are being told that DOT management is extremely concerned about the implications as well. 1. If PEF wins this fight and eliminates the need for FE exam you will be on the list and eligible for promotion. 2. If PEF is unsuccessful in eliminating the FE exam requirement you will have the option to pursue the FE exam and be eligible for promotion. If you do not take the exam, you will not be on the list or eligible for promotion. 3. If you pass the exam you are eligible for reimbursement of your application fee from PEF, so taking the exam will not cost you anything. Divisional Meeting will be held the evening of February 25, 2015. 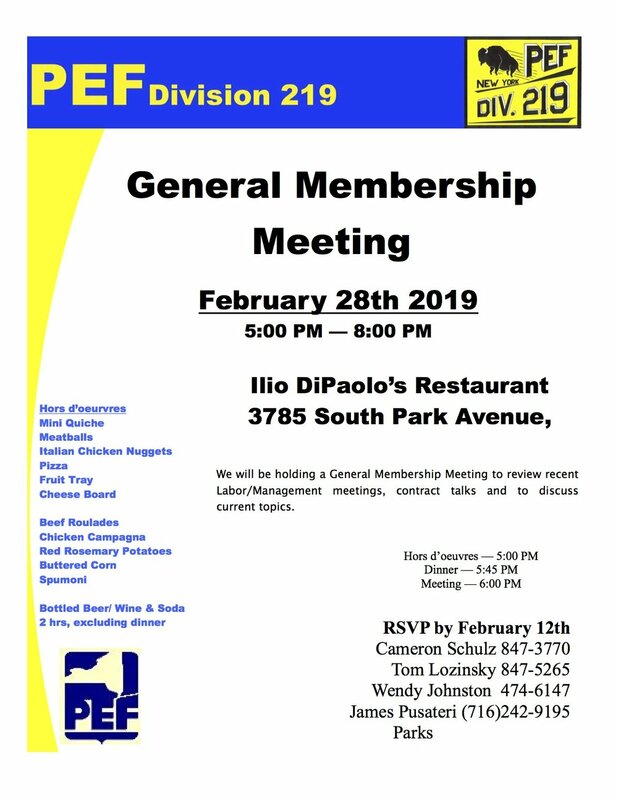 We will be holding our Winter Divisional Meeting at Ilio DiPaolo's Restaurant on South Park Ave in Blasdell on February 25th. We are still working on topics, if you have one you'd like covered tell one of your stewards. We are currently working on revising the Divisional Constitution to update it and include our Parks and ITS members. A copy of the current revised version is posted on the "Documents" tab. If you review the revised copy and have comments please use the General Inquiry Form on the "Contact Us" tab to let us know. We know that children lose their hats and gloves, especially during the coldest season. The Save OUR WNYCPC is sponsoring a hat and glove drive to support needy children and to keep the community informed of our efforts to keep the WNYCPC in West Seneca doing what it has done best – serving the needs of children and their families with mental illness for over 40 years. Let’s not lose a great facility, especially in the cold, let’s fight back and save our state services. Go to www.saveourwnycpc.org or visit our Facebook page to find out how you can help! The drive runs from January 20th through February 13th. More information regarding the Erie-Niagara Open can be found on the flyer by clicking here. The Division General Membership meeting was held on February 25th. We had a very informative meeting sharing Member Benefit information, Division efforts, Big PEF's position on various topics and a presentation on the Affordable Healthcare Act with the 55 members that attended the meeting. The presentation on Affordable health care that everyone found beneficial has been place on the documents tab under presentations. 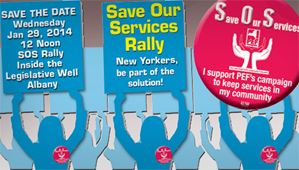 A SOS rally is being held in Albany on January 29th. This is a huge and important event. PEF needs to send a message to the Governor communicating that cuts in essential services, in most cases to the most vulnerable portions of the public, is unacceptable and a bad idea. It is very important that we show up in force so the message is loud and clear. This is not the time to be complacent. Just because our agency is not currently being targeted, it could be if this Governor continues to have his way. It is quite obvious that the Governor wants to privatize as many government services as he can, all in the name of saving money. We hope to see you and others take the time and jump on the bus for this important rally. Food and beverages will be provided. Support you brothers and sisters. Call the Regional office at 853-3100 and reserve your seat on the bus today! Click here for more information. On 11/22/13 PEF Division 219 Leadership informed me of concerns from the membership that the Administrator Services Department and Health Benefits Administrator were requiring a complete submission of personal and family information for employees wishing to renew their opt out applications. It was felt at that time that this demand was inappropriate as it was the Union’s understanding that only forms PS 404 and PS 409 were required. 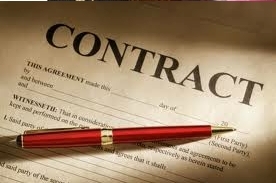 At that time I immediately sent a request for clarification to our Contract Administration Department and they had our Benefits Specialist check into it. By 11/26/13 I was informed that PEF had contacted Civil Service and that in fact only the two forms were required. I immediately forwarded this information to the DOT Region 5 Administrator Services Director. ‘In order to Opt-out of NYSHIP coverage, employees must provide information regarding their other employer-sponsored group health insurance coverage via an attestation on the PS-409; additional proof of other employer-sponsored coverage is not required. Dependent Proofs are only required if enrolling with the Family benefit and the dependent is not currently enrolled through the requesting employee's coverage. It should be noted, that no other NYS Agency, and to my knowledge only one other DOT Region were placing these requirements on our members. The failure to remedy this situation, and the resulting burdens placed on those Division 219 members negatively impacted rests solely on Region 5 Administration. As a result of the imposition of these unnecessary requirements by the Region, and the sensitivity of the information gathered it is my recommendation that any Division 219 member that has already submitted this extraneous data should request that it be removed from their reapplication packet and returned to them. I also want to remind those of you that have not yet reapplied to do so immediately. Should anyone experience any further complications in submitting their required forms they should contact one of the Union stewards on site immediately. The issue of providing documentation such as birth and marriage certificates, social security numbers, and financial documents with the PS-404 and PS-409 was raised. PEF pursued the issue with Civil Service and it was confirmed that this information is being required unnecessarily. Civil Service indicated that employees only need to submit the PS-404 form and the PS-409 form; no additional documentation is required. Copies of social security cards, birth certificates and marriage licenses are only required when the employee is adding a spouse/domestic partner or dependent child to his or her coverage. Civil Service has reminded the staff that assists the HBAs that employees aren’t required to submit any documentation other than the two forms. If you have any questions regarding this issue please do not hesitate to speak with either Cameron or Jeff. 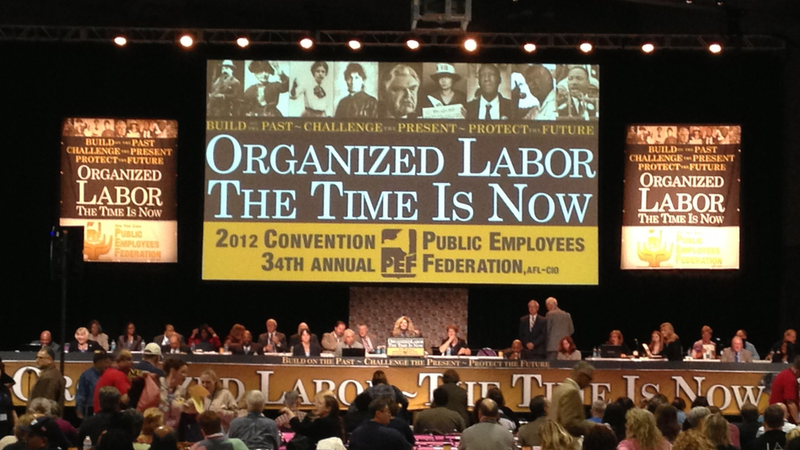 The 2013 PEF Convention was held here in Buffalo and was well attended. Cameron Schulz, Tim Haynes, Justin Przepasniak, John Duengfelder, Paul Uebelhoer and Tom Lozinsky Jr. represented the Division at this year’s convention. They participated in various workshops, the DOT and ITS Department Caucuses and all of the plenary sessions where resolutions will be debated and voted upon. The PEF Communicator has a in-depth writeup on the convention and can be found at the following link. If you have any questions about the convention, please do not hesitate to contact any one of the delegates. 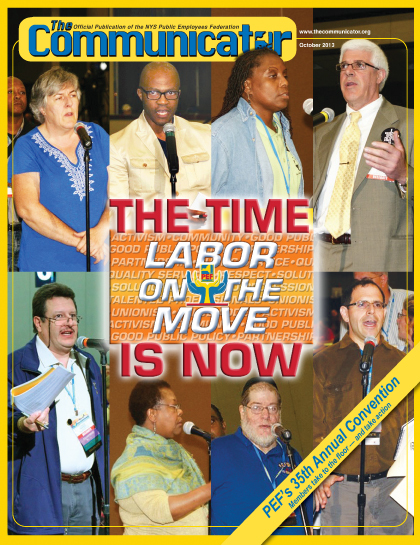 The 35th annual PEF Convention is almost upon us and is taking place right here in Buffalo. It will be held September 29th through October 2nd at the Buffalo Niagara Convention Center (BNCC), located at 153 Franklin Street, Buffalo, NY. In addition to the six delegates that Division 219 will be sending to the Convention you have the opportunity to attend any of the Plenary Sessions or the exhibitor area throughout the convention as a guest. With the convention taking place a short 15 minute walk from our DOT Regional Office this is your opportunity; if you’ve ever wondered about what takes place at the convention or how the Union conducts business at its highest level we recommend that you take the time and stop by. Cameron Schulz, Tim Haynes, Justin Przepasniak, John Duengfelder, Paul Uebelhoer and Tom Lozinsky Jr. will be representing the Division at this year’s convention and participating in workshops, Department Caucuses and the plenary sessions where resolutions will be debated and voted upon. Guests are permitted to attend the Convention in the Plenary Session and exhibitor area. However, to attend any of these sessions it will be necessary for you to obtain a visitor badge. Badges can be obtained in the Headquarters Office (Room 102) in the Convention Center. A visitor's section is provided in the plenary room; as guests are not permitted on the plenary floor. The rest of this email/posting contains information pertaining to the convention agenda, resolutions to be address and expected vendors at the exhibitor area. We hope to see you at the convention. It should be noted that if you plan on attending during work hours you need to charge the time to appropriate accruals and obtain the necessary supervisory approval. Additionally, if you do plan on attending please let Cameron know so that we can pass along the expected number of visitors to the convention organizers. If you have any questions regarding the convention please do not hesitate to contact any of the delegates. http://www.pef.org/ - Click on the banner at the top of the page and you’ll be taken directly to the resolutions. Should you have any questions or thoughts please feel free to contact any of the Division’s delegates. On August 24, 2013 join us - Realize the "Dream" spoken about by Dr. Martin Luther King, Jr. in his defining speech of the civil rights movement 50 years ago. This year we march to raise awareness of the issues that concern us today: economic justice, health care, education, voting rights, job and career opportunities. PEF and its international affiliates, AFT and SEIU, are proud to support the 2013 March on Washington. Transportation will be provided. For more information call the PEF Organizing Department at 800-342-4306 ext. 227 or go to www.pef.org. The 7th annual Region 1 PEF picnic will be held at Fontana's Picnic Grove (2299 CLinton Street, Buffalo, NY) on July 31, 2013 between 4:30 pm and 8:30 pm. The picnic is free to all PEF members, $10 for PEF retirees and guests. Please RSVP by July 26th to Pat Sante at the Regional Office 716.853.3100 ext 106. At the January Division 219 Council meeting Cameron Schulz (Council Leader) and Tim Haynes (Assistant Council Leader) were elected to new leadership positions. The mid-term adjustments were required to fill a void left on the Council with Craig's resignation from the Department of Transportation. The vacant steward position will be filled through a special election. Big PEF is sending the paperwork necessary to start the process to the Division. We hope to have the paperwork soon and intend to post important information, such as dates and where to obtain the petition forms, on the Division website and at the Regional Office on the PEF bulletin boards. The PEF Region 1 office will be accepting donations to assist downstate PEF member impacted by Hurricane Sandy. See more information on the New PEF Region 1 News page. Check the Documents page for new documents for the PEP, Empire Plan Drug List and Opt Out Option. PEP enrollment deadline is 11/30/12. If you are currently enrolled in PEP, you must reenroll to continue participation in 2013. Memo & Forms are included on the Documents Tab. Option Transfer information is posted at http://www.cs.ny.gov. Online Option Transfer is also available through MyNYSHIP. New health insurance option effective date for institution Payroll employees as announced in NYSHIP Rates & Deadlines. New health insurance option effective date for Administration Payroll employees as announced in NYSHIP Rates & Deadlines. Once the NYSHIP Rates & Deadlines is issued the above information will be updated with the appropriate deadlines. 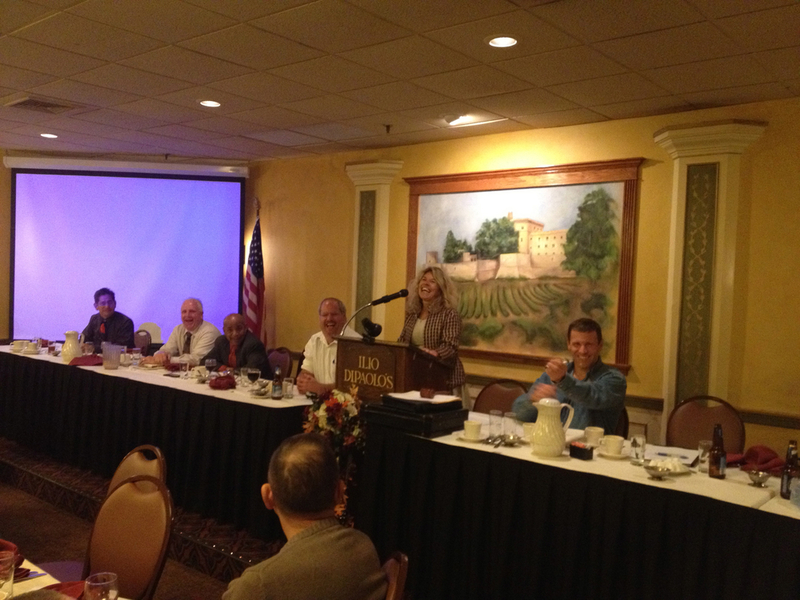 The 34th annual PEF Convention was held in Syracuse, New York, from October 14th to October 17th, 2012. I am pleased to report that Division 219 was well represented with our full contingent of Delegates that included Cameron Schulz, John Duengfelder, Paul Uebelhoer, Justin Przepasniak, Tom Lozinsky Jr. and Wilson Martinez. They were on the convention floor every day, took part in the workshops that were offered, went to the Department Caucus and corroborated with our counterparts from across the state. Some of them even helped out doing various tasks to help the Convention stay on track. We heard from numerous guest speakers, including the NYS Controller Thomas P. DiNapoli, who “thanked us for the work we do” and reminded us that “the retirement system is healthy and growing” despite what you see in print or hear on the radio. He also reminded us that we do not need to go to a 401K type style of retirement system that has been talked about. DiNapoli stated that “the 150 Billion Dollar retirement system is the largest of its kind in the United States. The retirement system is well funded, well capitalized and most importantly of all, healthy.” All good reasons why we should be doing whatever we can to protect our investment in the NYS retirement system. We also heard from our new PEF President, Susan Kent who stated during a question and answer period that “if she was the PEF president and 3426 PEF represented employees were threatened by the Governors office with a layoff, she would have demanded to see the books and to be shown where the deficient in the NYS budget is, and why the only solutions are give backs in a contract or employee layoffs.” Next years Convention is right here in Buffalo, New York from September 29th, 2013 to October 2, 2013. Stop in while the convention is in session and watch how your Union works for you. Hope to see you then. PEF 219 members attending the Division meeting got to hear directly from the new PEF Leadership. New PEF President, Susan Kent spoke during the meeting and circulate with members after the official meeting was closed.